Metal cutting is a subject as old as the Industrial Revolution, but one that has evolved continuously as technology has advanced. Currently, the development of products at the nano- and microscale is being driven by economic necessity in order to improve the quality of life. Although the miniature devices may be manufactured by various procedures, their shaping through removal of material constitutes a major means of production. Established and recently developed methods of machining continue to be investigated for the shaping of such parts to specified small dimensions. The term ‘‘micro and nanomachining’’ has thus emerged and is generally used to define the practice of material removal for the production of parts at small scale. The international technology assessment study has focused on the emerging global trend toward the miniaturization of manufacturing processes, equipment and systems for microscale components and products. This ultraprecision machining (or micro and nanomachining technology-MNT) approaches can begin to be compartmentalized by separation into either a ‘‘top-down’’ or ‘‘bottom-up’’ approach. Top-down fabrication refers to methods where one begins with a macroscopically dimensioned material while bottom-up fabrication refers to build up structures atom by atom. The study of MNT has investigated both the state-ofthe- art as well as emerging technologies from the scientific, technological, and commercialization perspectives. This will undoubtedly have serious long-term implications since it is well-recognized that micromanufacturing will be a critical enabling technology in bridging the gap between nanoscience and technology developments and their realization in useful products and processes. It is assured that the importance and number of MNT will grow dramatically in the coming years with the rise of nanotechnology. It is clear that scientists and engineers working from many different directions and finding their inspiration from engineering, chemical, and physical sources, are all contributing greatly to the field of MNT. Thus, it is our belief that readers from all fields will find material of interest in this multidisciplinary topic, and perhaps even find additional inspiration to invent the next-generation MNT methods and tools. 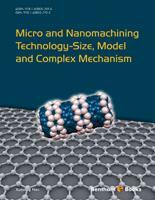 The eBook edited by Prof. Xuesong Han provides a broad overview of the micro and nanomachining technology and the recent advancement. Chapters written by him in his research fields will make the reader acquainted with a variety of topics ranging from the role of MNT, the basic investigation methods and the meaningful results. As such, the volume should be particularly useful to basic investigators, engineers and postgraduates interested in the latest advances in this exciting field. Nanotechnology is seen as the next step in the industrial revolution and, as such, requires machining processes that will revolutionize the way small products are made. It is clear that micro & nanomachining has already been a daunting task. A remarkable enhancement in computational capability (computer hardware) and high performance computation techniques (parallel computation) has enable us to employ the large scale parallel numerical simulation to investigate the micro & nanomachining and gain insights into this process. Process modeling and optimization with the help of computers can reduce expensive and time consuming experiments for manufacturing good quality products. Micro & nanomachining is not the similarity reduction but should be some new mechanism plays a dominant role. This eBook aims to provide the fundamentals and the recent advances in micro and nanomachining for modern manufacturing engineering. The eBook is divided into five chapters. Chapter 1 is an introduction to micro & nano machining technology (MNT). A brief history of MNT is provided here to highlight the important roles this field has played in manufacturing technology development. The historical development of different MNT is introduced in the second half of this chapter. Further advancements in the MNT can be aided through a theoretical understanding of micro & nanomachining. The diversity of these processes renders difficult a generalized theoretical analysis of MNT; however, the methods of molecular dynamics are becoming increasingly attractive for studies of MNT, especially as the technology advances toward the shaping of parts in the nanometric range. The foundations of molecular dynamics that are needed for theoretical treatments of micromachining therefore form the basis of Chapter 2. Chapter 3 focuses on the fundamental principles of finite element as well as some key factors on numerical modeling of micro & nanomachining and current advancements. Chapter 4 discusses the recent advances on multiscale method, its theoretical basis and their roles on investigation of MNT. Owing to the combination of constantly increasing computational power and the increased knowledge and understanding of material behavior, multiple scale modeling methods have recently emerged as the tool of choice to link the mechanical behavior of materials from the smallest scale of atoms to the largest scale of structures. Chapter 5 focuses on the complexity of MNT. The self-organization of MNT, energy dissipation, and fractal analysis of machined surface acquired by MNT are given in this chapter. The author thanks a large number of groups and people who have directly or indirectly contributed to making this eBook possible. Many thanks are due and sincerely given to Prof. Bin Lin for putting part of the cooperation work into this eBook. I also wish to note my appreciation to Mr. Xiaohu Liang for helping me diligently in providing corresponding materials. Most of all, I would like to thank my family for the understanding and love that made writing of this eBook possible. This work is supported by China Scholarship Council (Grant No. 201208120091). The author confirms that this eBook content has no conflict of interest.